Next post: 3 Mysteries With A Creative Slant! The One Main Café & Grill in St. Agnes Hospital. On the first floor, underneath the main lobby, One Main has the usual packaged sandwiches, salads, soups, and snacks, along with both Coke and Pepsi drink products, but there is something that elevates this basement: made-to-order dishes. Walk up to a set of touch-screen terminals and take a gander at the bill of fare for the day—Café meals, Grill specialties, and more. Each dish can be customized, and there are delicious side dishes to be had. Take your time in choosing, and if you get confused, staff and frequent eaters happily show you how to maneuver the ordering…especially if they are next in line. Once your order is complete, you get a printout with your cost and order number. Pick up the drinks and et cetera-s you want to go along with your meal, and you can proceed to the cashier. 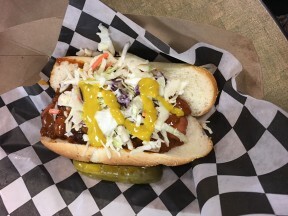 Once you’ve paid, go to the tastefully-appointed dining area, or you can hang around the grill area, watching the video screen until your number turns green and is announced as ready. All in all, it’s a pretty efficient procedure. If you want to make it even more streamlined, there is an app you can get so you can order over your favorite device, and it will be ready for you when you go down to the café. Some of the café’s business comes from employees at other businesses in the area! That’s a great set-up, but..…What About the Food? Each week has a different rotation of the menu, but this is what we had when we visited. 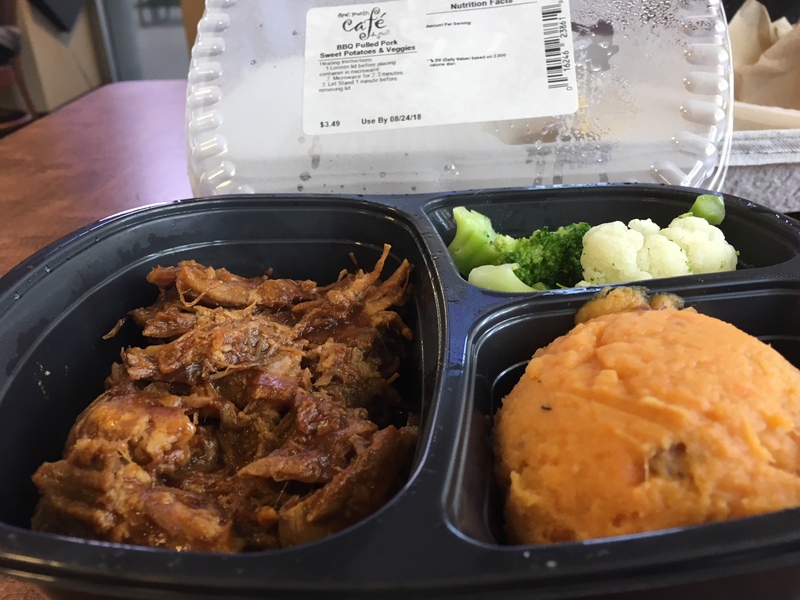 Pulled Pork & Sweet Potatoes at St. Agnes Hospital’s One Main Café & Grill. Yummy! 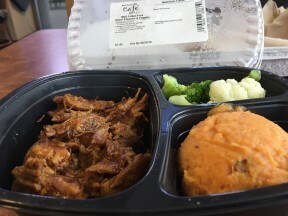 Pulled pork, mashed sweet potatoes, and veggies—The pork had a tangy BBQ sauce, and the sweet potatoes compared to regular potatoes like a souffle to scrambled eggs. Turkey-avocado sandwich with deep-fried green beans—I wanted to take home the cook, just to be able to get these beans at will. 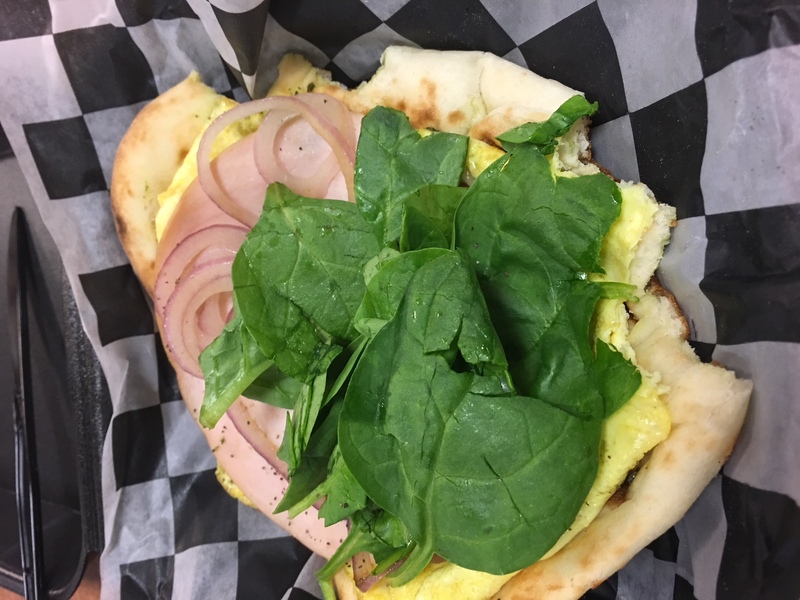 Couldn’t wait to munch on spinach, onion, turkey, eggs and flatbread at One Main Café and Grill below the lobby of St. Agnes Hospital. Mushroom Alfredo pizza—Somewhere between triangular and heart-shaped, it was tender, it was tasty, and it made me want to make someone sick so I could visit them and have this again. Hot Dog—It starts as a frank of your choice on a bun, and there were onions, there was sauce, there was coleslaw, and mustard zigzagged along like the scar on Harry Potter’s forehead. Philly Cheesesteak Quesadilla—Pennsylvania Mexican! I added the avocado because I wanted to, and because I could. Biscuits & Gravy & Scrambled Eggs & Sausage—What a breakfast! Everything was fluffy…even the sausages! 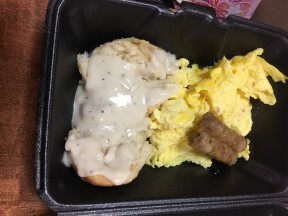 Biscuits & Gravy breakfast at St. Agnes Hospital? Wow! I Don’t Remember What They Called It, But—Ham, onions, spinach, and eggs, on a thick tortilla-pita thing. I was ready to face the rest of the day at the hospital. This week, I talked to a long-time friend who had eaten at One Main for ten days while a spouse recuperated from open-heart surgery. They raved about the food, too. Since the Café caters to staff as well as to visitors (Yes, you can have just what the doctor ordered), it’s open from 6 a.m. to 4 a.m. That’s right—22 hours a day! 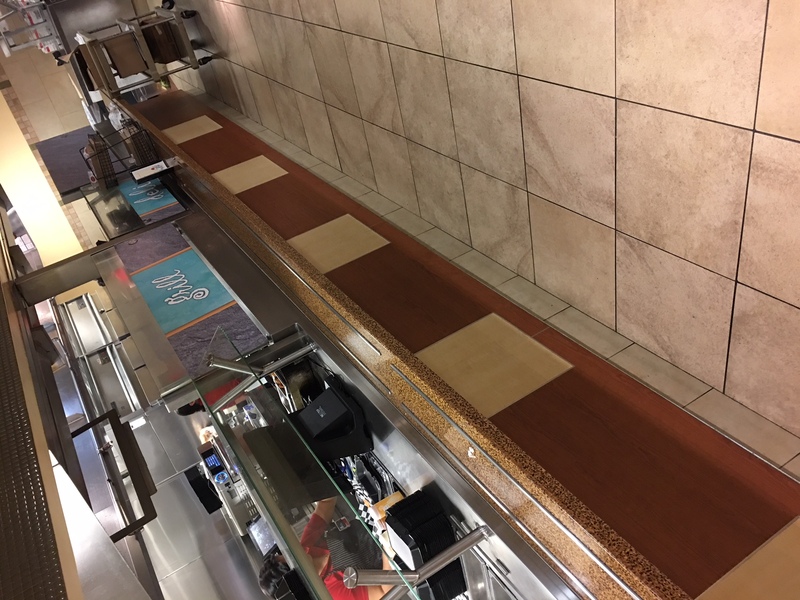 There is also the Harris Cyber Café in the North Wing of the second floor, with hot and cold beverages, specialty sandwiches, salads, desserts, and snacks, open from 6:30 a.m. to 2 p.m. 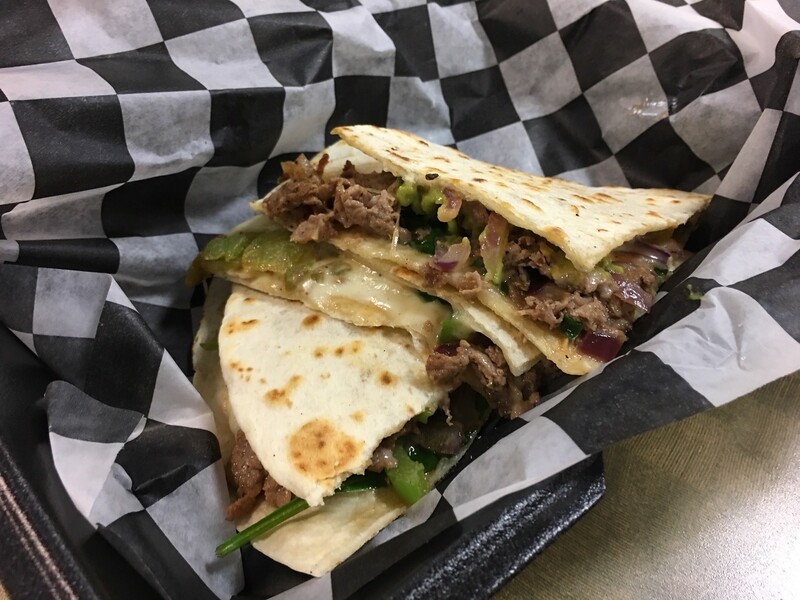 Remember, folks, you don’t have to put someone in the hospital to enjoy the food at the One Main Café & Grill at St. Agnes Hospital, 1303 Herndon Avenue in Fresno. Wowwwww what a well written article! I happen to manage the food service here at Saint Agnes and would love to meet you in person! Thank you so much for writing about us and such wonderful comments and pictures of my little place! !